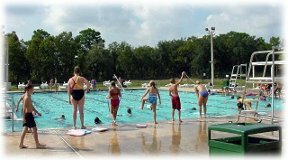 Local Parks in Citrus County Florida. Citrus County Florida is very unique in that nearly 40% of the land is set aside for public use. This includes Federal Wildlife Parks, State Forests, Historical Landmarks, Wildlife Sanctuaries, Wetlands and Birding Trails, as well as Springs, Campgrounds, and Recreation Parks. This offers the residents of Sugarmill Woods and all of Citrus County the opportunity to experience the great outdoors and all that nature has to offer. 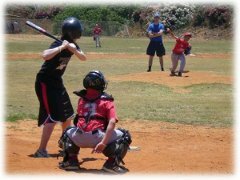 Lecanto Florida offers a huge sports complex housed at the Central Ridge District Park offering three Baseball Fields, Concession Facilities, Jogging Trail, Pavilion, Picnic Tables, Playground, two Soccer Fields, and a Softball Field. At some of these parks free movies under the stars are offered during the summer. Bring your family, picnic basket and blanket to this fun movie night in the park. Crystal River is home to the only saltwater beach in Citrus County. Fort Island Beach on the Gulf of Mexico features a man made Beach, Boat Ramp, Fishing Pier, Pavilion, Barbecue Grills, Picnic Tables, Restrooms, and Showers. 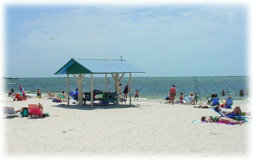 Hernando Beach Park features similar facilities, but on the fresh water lake of Lake Tsala Apopka. Crystal River also has a sports oriented complex at Bicentennial park. It contains four Baseball Fields, a Basketball Court, Pavilion, Picnic Tables, Playground, three Racquetball Courts, a Skate Park, three Softball Fields, a huge Swimming Pool, four Tennis Courts, and two Volleyball courts. 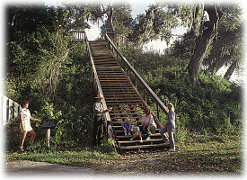 The Crystal River Archaeological State Park is a National Historic Landmark. This 61-acre, pre-Columbian, Native American site has burial mounds, and temple platform mounds. The six-mound complex is one of the longest continuously occupied sites in Florida. For 1,600 years the site served as an imposing ceremonial center for Native Americans. People traveled to the complex from great distances to bury their dead and conduct trade. It is estimated that as many as 7,500 Native Americans may have visited the complex every year. The Crystal River Preserve State Park is a place of exceptional natural beauty, the undisturbed islands, inlets, backwaters and forests of this Crystal River Preserve are especially cherished by nature lovers and photographers. 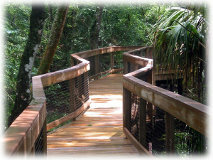 The park borders 20 miles of the northern Gulf Coast between the two cities of Yankeetown and Homosassa. Visitors can hike or bicycle along nine miles of trails or study the native wildlife and plants on the two-and-a-half mile trail. Anglers can walk down a short path to the Mullet Hole for a relaxing afternoon of fishing. Paddlers can launch a kayak or canoe into the waters of the scenic Crystal River to see the park from the water. Closer to Sugarmill Woods, the nearby Homosassa Springs Recreation Park offers a Baseball Field, Basketball Court, Concession Facilities, Jogging Trail, Picnic Tables, Playground, six Soccer Fields, and two Tennis Courts. At the Ellie Schiller Homosassa Springs Wildlife State Park visitors can see West Indian manatees every day of the year from the park's underwater observatory called the “fish bowl” in the main spring. 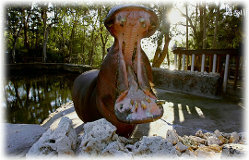 The zoo-like park showcases native Florida wildlife, including manatees, black bears, bobcats, white-tailed deer, American alligators, American crocodiles, and river otters. Manatee programs are offered three times daily. At the Wildlife Encounter programs, snakes and other native animals are featured. Recreational opportunities include picnicking, nature study, and bird-watching. The park features a children's education center, providing hands-on experiences about Florida's environment. 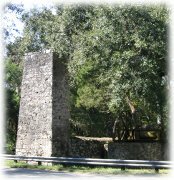 Not far from Sugarmill Woods is its namesake the Yulee Sugar Mill Ruins Historic State Park. This site was once part of a thriving sugar plantation owned by David Levy Yulee. Yulee was a member of the Territorial Legislative Council, and served in the U.S. House of Representatives and U.S. Senate after Florida statehood. The park contains the remnants of the once-thriving 5,100-acre sugar plantation: a forty-foot limestone masonry chimney, iron gears, and a cane press. The steam-driven mill operated from 1851 to 1864 and served as a supplier of sugar products for southern troops during the Civil War. Fort Cooper State Park in Inverness sits beside the sparkling waters of Lake Holathlikaha which were a welcome sight to sick and wounded soldiers during the Second Seminole War. In 1836, the First Georgia Battalion of Volunteers built a stockade for the soldiers resting here, enabling the Volunteers to hold their own through several skirmishes with the Seminole Indians. The park´s diverse natural areas provide a refuge for many plants and animals, including threatened and endangered species. Nearly five miles of self-guided trails offer some of the best bird and wildlife viewing in Citrus County. The Chassahowitzka National Wildlife Refuge Complex consists of the Crystal River, Chassahowitzka, Egmont Key, Passage Key and the Pinellas National Wildlife Refuges. The Chassahowitzka National Wildlife Refuge established in 1941, is comprised of over 31,000 acres of saltwater bays, estuaries and brackish marshes at the mouth of the Chassahowitzka River. The refuge was established primarily to protect waterfowl habitat and is home to over 250 species of birds, over 50 species of reptiles and amphibians, and at least 25 different species of mammals, including the endangered West Indian Manatee. 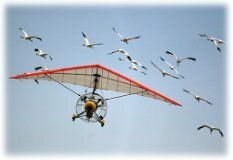 Chassahowitzka is also home to a flock of endangered whooping cranes that make an annual migratory flight from Wisconsin to Florida with the help of an ultralight aircraft as leader. The annual fly over is a much anticipated event by local residents. This introduction to the public parks and natural settings that Citrus County offers its residents only touches on the surface of all that is available. Environmentally minded residents continue to expand the boundaries of eco friendly activities surrounding Sugarmill Woods.